Pulse of My Heart: A Gallagher Novel has been released and is now available through the following online sites: Amazon, Barnes and Noble and Outskirts Press. 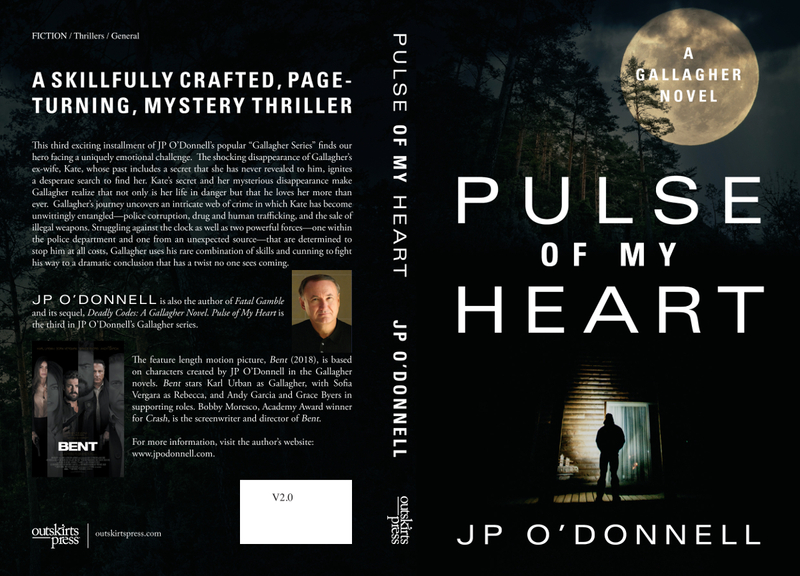 Coming soon: Pulse Of My Heart, the new novel by JP O'Donnell is scheduled to be released in the near future! Check out the cover! JP O'Donnell was recently interviewed by Jordan Rich of WBZ Radio as part of his "Authorbytes" podcast series. Check it out here! Bent is now available on several formats including Blu-ray, DVD, Amazon Video, On Demand and more! See the trailer for Bent! 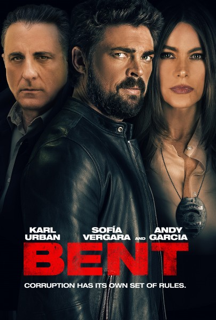 Bent, the movie based on JP O'Donnell's second Gallagher novel, Deadly Codes, is being released to theaters across the United States on Friday, March 9th. Bent stars Karl Urban as Gallagher, Sofia Vergara as the femme fatale, Rebecca, and Andy Garcia as the main supporting actor. Oscar winner Bobby Moresco is the Director and Screenwriter. Lionsgate (Grindstone) is the domestic distributor. April, 2017: Bent: Karl Urban, Sofia Vergara and Andy Garcia Join Thriller! The movie based on Deadly Codes is now set to become a reality! June, 2010: Author Interview: J.P. O'Donnell is now up at the "My Reading Room" blog. February, 2010: "Deadly Codes" is now available as a free audiobook at Podiobooks.com. January, 2010: "Fatal Gamble" is now available as a free audiobook at Podiobooks.com. Look for a similar offering for "Deadly Codes" in the coming weeks. November 23, 2009: J.P. O'Donnell was selected as a guest essayist on Murder by 4. Click here to read the essay "Your First Line." November 12, 2009: Blogger News Network review "Book Review: Deadly Codes - A Gallagher Novel by J.P. O'Donnell"
August, 2009: J.P. O'Donnell was interviewed on WBZ radio a couple of weeks ago, and the interview is available on the host's website: Jordan Rich's website. Click on the "Listen to Podcasts" link. June 29, 2009: Both "Fatal Gamble" and "Deadly Codes" have recently been awarded "Reader's Choice" by iUniverse, in addition to being previously awarded "Editor's Choice." This is an indication that the books not only meet the high editorial standards of the Editorial Board at iUniverse but also have demonstrated wide appeal to readers and reviewers. June 19, 2009: J.P. O'Donnell will be a guest author for a book signing at the Bedford Farmer's Market on Monday, August 10th from 2-6pm as part of their "Locally Grown Literature Day" event. He will also be speaking to the Friends of the Woburn Library on Thursday, September 24th. May 26, 2009: A nice review of "Deadly Codes" can be found at Feathered Quill Book Reviews. "Deadly Codes" is a spotlight review book! May 13, 2009: A nice review of "Fatal Gamble" from Feathered Quill Book Reviews. "Fatal Gamble" is a spotlight review book! Spring 2009: "Fatal Gamble: A Novel", a review from the Massachusetts Dental Society. 2/9/2009: Read "Publish or Perish", an article from Pulpdent's weekly newsletter from February 1st. 2/5/2009: J.P. O'Donnell has been invited to speak and hold a book signing at the Jenks Senior Center in Winchester, MA on June 4th at 7:00pm. 1/28/2009: "Deadly Codes" has earned the prestigious Editor's Choice title from iUniverse! The Editor's Choice icon will improve the book's marketability by designating it as a high-quality title.